Are you ready to break out of old self-defeating habits that are blocking your body’s own natural ability to heal as well as the mental habits keeping you stuck? If so, join me for this life-changing 7-Module audio course designed to support you through transformative shifts in body, mind, and spirit. Find out where your energy has become blocked or stagnant and why this may be keeping you in the same health ruts that you can’t seem to get out of. 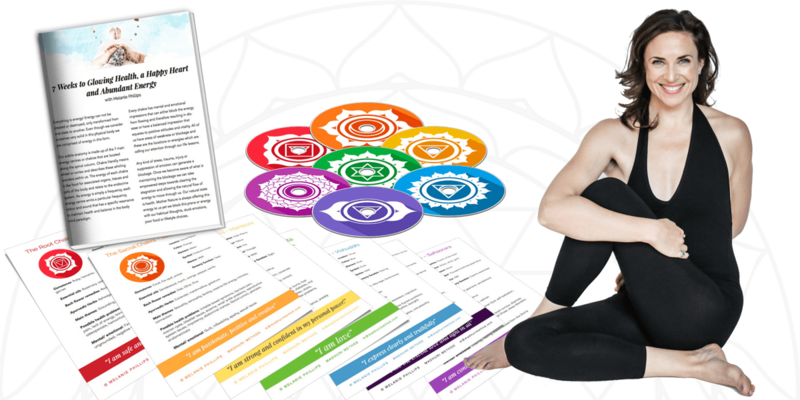 Learn about the 7 main chakras or energy centres and how you can bring balance through specific practices and exercises. Each module will focus on one of the 7 energy centres (chakras). Using my wisdom base drawn from Yoga, Ayurveda, Meditation, Bio-Energy Healing and my own life experience I will guide you through an experiential understanding of each chakra, how it relates to you in your life, and practical tools for you to unblock the stuck/ stagnant energy from your system. Understanding the chakra system allowed me to heal from a debilitating auto-immune condition that I had for almost a decade. I integrated my understanding of Ayurveda and Energy Healing into my life to heal. We can’t return to a state of great health if we ignore the mind, heart and conditioning that can be at the root cause of illness. Join me for this life-changing audio intensive, designed to support you through transformative shifts in body, mind, and spirit! Disclaimer: This program does not take the place of medical advice. It is solely for educational purposes. To make sure you have a streamlined experience please read! Some email providers will not recognize our email address. Please check your spam- or trash folder for your confirmation email from “Madhuri Method”. Please check the email address you used to register for your product. If this email address is different then the email address you used to purchase your product with Paypal (or Stripe gateway) our system won’t recognize you. If this is the case please let us know below so we can assist you. Please use the “Login” information you received in your confirmation email from Madhuri Method to login to your account where you can stream or download your videos or audios. You will find download links as well as the option to stream the media directly from the course page.